I have changed few things like I used Gold cardstock instead of heat embossing and 3-D Crystal Lacquer to get the faux stained glass look. Basically you die cut the detailed die a few times and stack them to create a chipboard like piece... color the base and fill in the depressions with any clear product like 3-D Crystal Lacquer, Glossy accents etc... and let it dry. The top layer can be changed according to your preference like white, gold, silver, black or any other color of your choice. The top layer is adhered after the 3-D Crystal Lacquer is completely dry so that any imperfections can be masked. Scroll down to see the full instructions and supply list to make this card. Alcohol markers in Green and red colors, gold cardstock, rhinestones and pearls. Take a piece of 5" x 6" white cardstock and cut the top portion at an angle as shown. Use 2 of the inner dies from Frame a Card Leafy Borders Die and position them along the border and die cut the cardstock. Take a piece of 5" x 5" Vellum and adhere it to the back of die cut white cardstock using Metal Tip with Designer Dries Clear Adhesive. 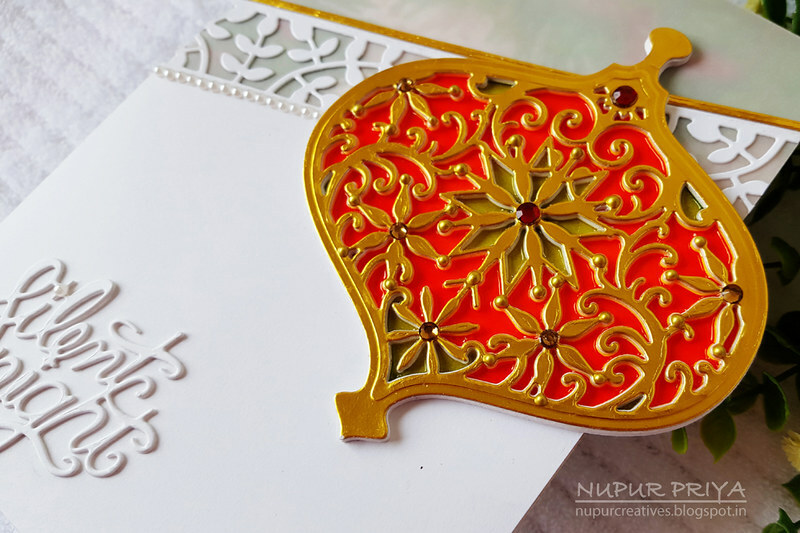 Add a thin strip of gold cardstock to the die cut edge. Align the white cardstock part with 0 on the Scoring Board and score the Vellum at 7". Adhere the scored part on a 5" x 7" white cardstock to make the card base. 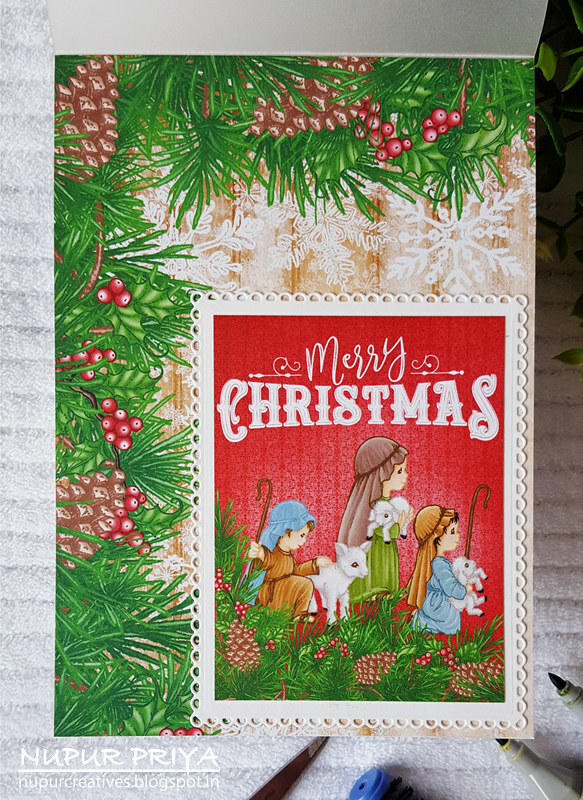 Cut a piece of 5" x 7" pattern paper from the O Holy Night Paper Collection and adhere it to the inside of the card. Die cut a piece of white cardstock using the Eyelet Rectangle & Basics Die. Cut a piece of sentiment panel from the same paper collection and adhere it to the die cut. Glue it to the inside of the card as shown. 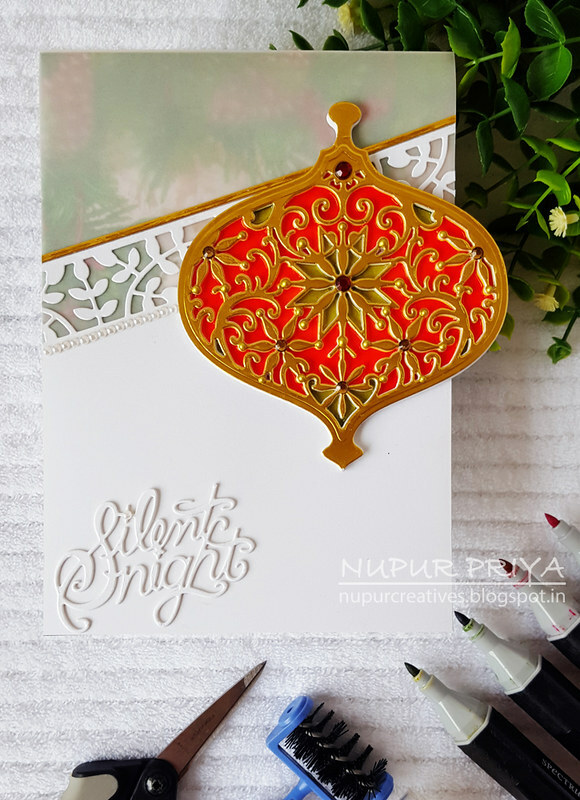 Die cut 2 pieces of white cardstock using the Silent Night die from Silent Night Scroll Die. Adhere them together and glue it down on the bottom left corner of the card front. Add a line of pearls below the Leafy Borders Diecut to add finishing touch. So beautiful! 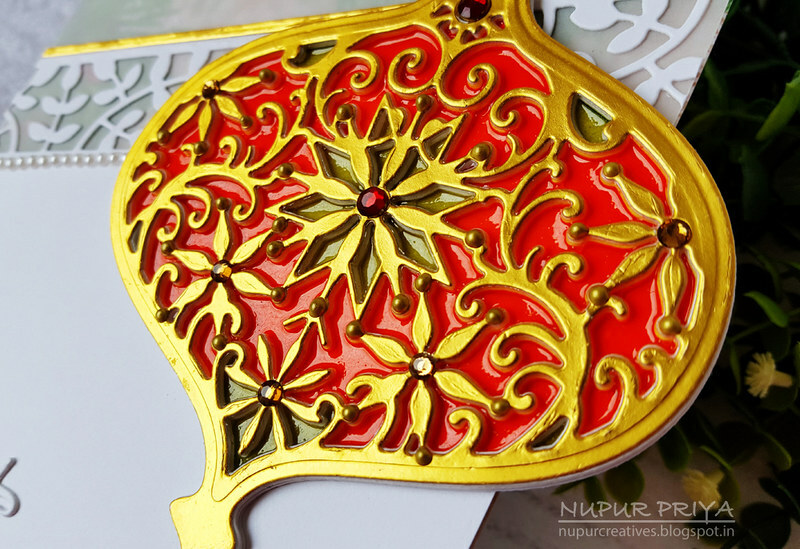 I love how you've used the crystal lacquer, such a wonderful effect with the pretty ornament!